I never thought I would, but I miss blogging and chatting with you. This week has been crazy. There was nothing unusual going on but I was getting obsessed about planning of one of my lectures so I was focusing a little too much (read: day and night) on this issue and ended up not thinking about make-up very much. That said I have worn make-up almost every day and tried out some of the pieces I picked up from Chanel Vamp Attitude Collection last week. This just arrived to our shores recently so although it might be old news for some of you, I would still like to share my thoughts about the pieces I have picked up. Two of the items which disappointed me most were the blush and the eye shadow quad. I reserved the blush, Joues Contraste Coups de Minuit and tried it at the counter just to see that the effect over my cheeks was so subtle that no one could see it. I went back another day to try it out on another blush, I failed again to see anything although I tried it at different lighting conditions. I concluded that Coups de Minuit is not right for light to medium complexion with natural undertones because it is exactly that so if you are close to me, you will probably only find it useful as an all over powder. Deeper skin tones might enjoy it fully, check out here Sabrina, who is a few tones deeper than me with olive undertones praise the highlighter. Melanie has fairer skin with cool undertones and she also loves it although Missfrankiecat and Silverkis agrees with me on how "invisible" the effect is. ... some of us seen the swatches. It was looking nothing like expected. The complex shimmer was not there, the pigment was lacking in 2-3 of the 4 shades too. From that point on, there were only the collectors and bloggers who were investing in this piece, plus maybe some who didn't have the possibility to swatch it and ordered online. I included some comparison swatches below for you to see how different is the textures. 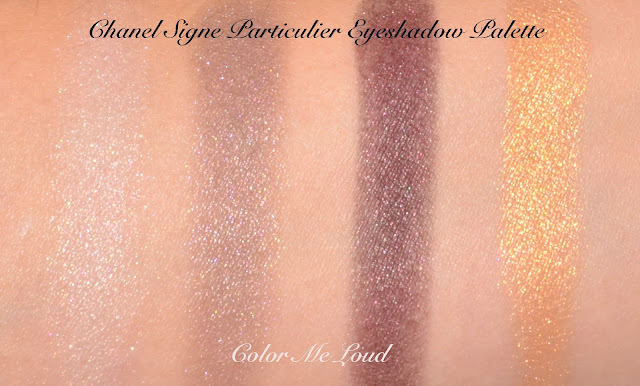 On those swatches I had to dig into Signe Particulier and layer it multiple times for it to show up. Not to mention that the texture feels rather dry compared to the buttery Harmonie du Soir and Topkapi. The issue is especially with the light pink and taupe shade. The deep burgundy and gold shades have better pigmentation but dry texture. I also noticed that this quad is not named Regard Signé as the other two. That said, I checked the ingredients and found out that they were similar to the former quads. It is hard to conclude if it was meant to be a third one of the same series other than the similarity of embossment. The problem is not only with pigmentation and dryness but also the shades don't blend well and loose intensity over time. Here is a look I came up with this week. This lasted long on my eyelids (14 hours) but at the end of the day gold was looking more like a beige shade. The highlighter shade almost doesn't show up on me and taupe is good for a no make-up look, literally. I also tried to wear the palette over Illusion d'Ombre in Rouge Noir but I was not impressed either, hence I didn't included that one here. Luckily Illusion d'Ombre Rouge Noir is very beautiful and wearable on its own, loving that one. 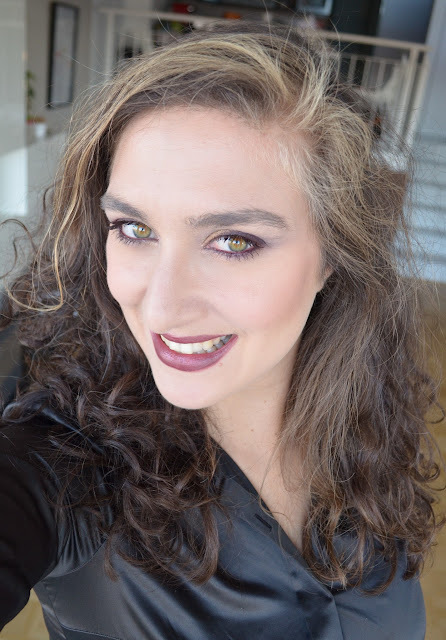 Below I am also wearing Le Crayon Khol in Rouge Noir and Le Volume Mascara in Rouge Noir, which make up the look despite the bad quality eye shadow. Now off to the pieces I love at the moment, Illusion d'ombre in Rouge Noir is to die for. I believe this one will be permanent. I wore it this week but it was too dark to take a photo that day. I will try to post some looks and comparisons of this one later on after I am done reviewing the limited holiday collections. By the way since I am not blogging everyday now, I found out that blogging makes much more fun. I was a little stressed to find time otherwise and "product". Now I write really whenever I have some minutes I would like to spend with the blog and only about the pieces and bits I love or have something to say about. 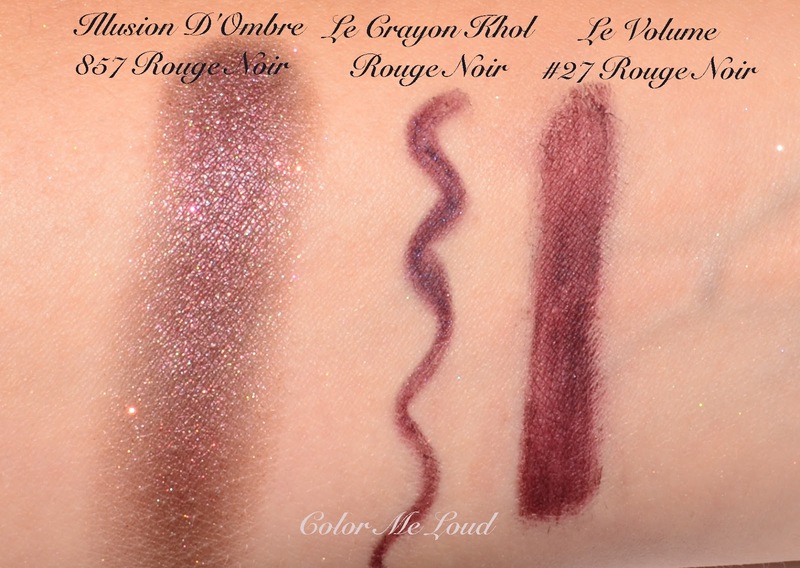 Here is the swatches of Rouge Noir trio, so much love for all of these. 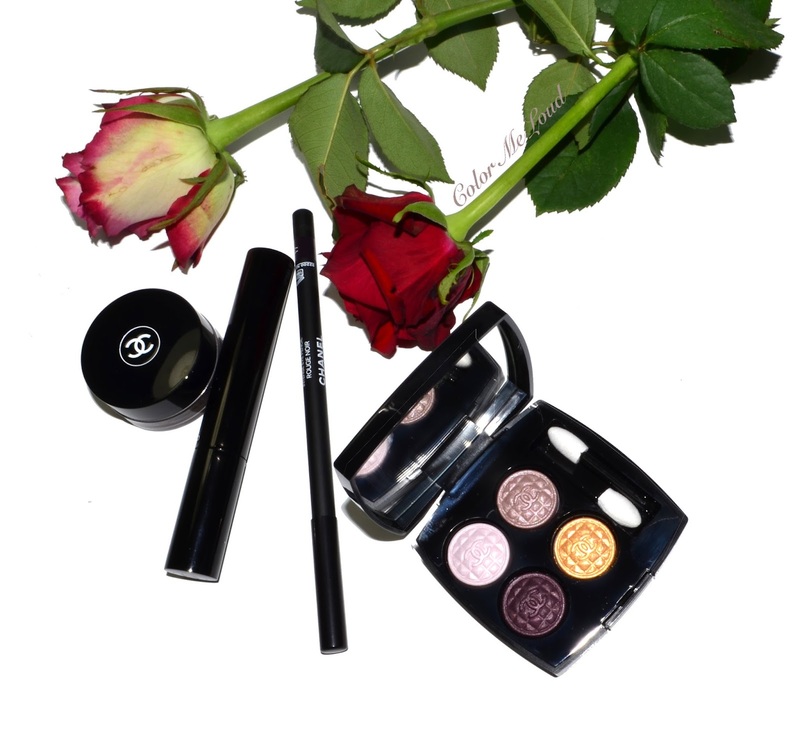 I have already declared my obsession to Le Volume Mascara on this feature I wrote this week for innenaussen and included it in my 3 holy grail products together with Tom Ford Blush in Frantic Pink and Urban Decay Eyeshadow Primer. It is the only mascara which holds the curl of my lashes. 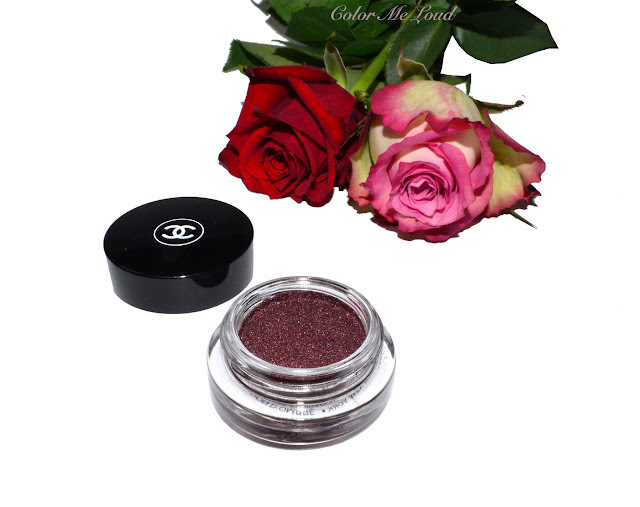 Le Crayon Rouge Noir is simply perfect for green eyes, it makes them pop like nothing else does. After preparing the swatches, I noticed that I already own Rouge Allure #109 Rouge Noir Lipstick which I used to love a few years ago. Since it is not an everyday shade, it went on forgotten in my drawer. Anyway, it is not the best formula but it is very flattering again for green eyes and matches so well with the rest of the collection. Here is my Vamp Attitude look. And to conclude, here is my haul from Vamp Attitude Collection. It ended up to be smaller than I anticipated it would be but I am happy with the pieces I got (minus the quad). I will post about the nail polishes hopefully in a separate post. I am still waiting for two of them which are missing from Rouge Allure Collection which never made it to Germany. I started to get worried so I will now go on making a back-up plan before these are gone. Thanks very much to the lovely SA at Breuninger who gave me three minis of Les Exclusives with my purchase after I told her that I am collecting those. Only if she knew I am also collecting the full sizes haha! 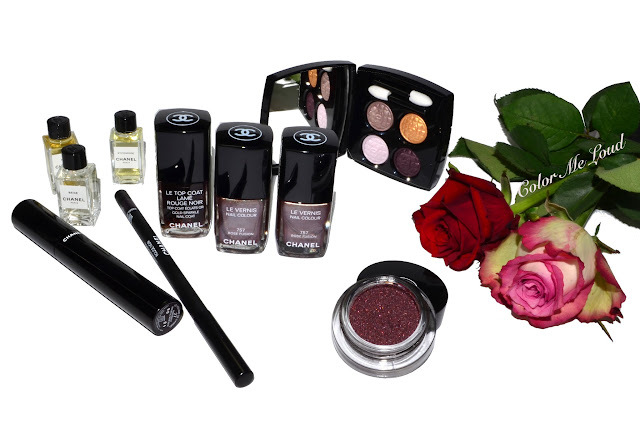 Final thoughts: My highlights of the Rouge Noir collection are Illusion d'Ombre in Rouge Noir, the matching Khol and Mascara. I hope all three are making it to the permanent line. I am obsessing over Rose Fusion Nail Polish which I had to back up. A big Rouge Noir fan here, love the tone so much! What is your highlight of this collection if you ended up getting some of the pieces? Do you like Rouge Noir theme? I love the famous rouge noir polish ( I was in university when it was created : that was a little révolution ! Here the illusion d'ombre looks great but I probably only going to buy only a bottle of number 18 ! I ended up getting quite a lot from this collection... My faves are the kohl pencil, the two bolder lipsticks and the three nail polishes. Actually I haven't used my Illusion d'Ombre or the quad yet! I applied the quad for a night out once and it seemed fine, but I didn't check on it any more after that 😂. I so missed you and your posts! Everyday I check whether there is a new post to your blog but then I realize how difficult it is for you to combine blogging with work schedules and deadlines and then I appreciate even more your effort to review for us all this Holiday make up storm ! This collection it was the one that I anticipated more! I ended up almost with everything! 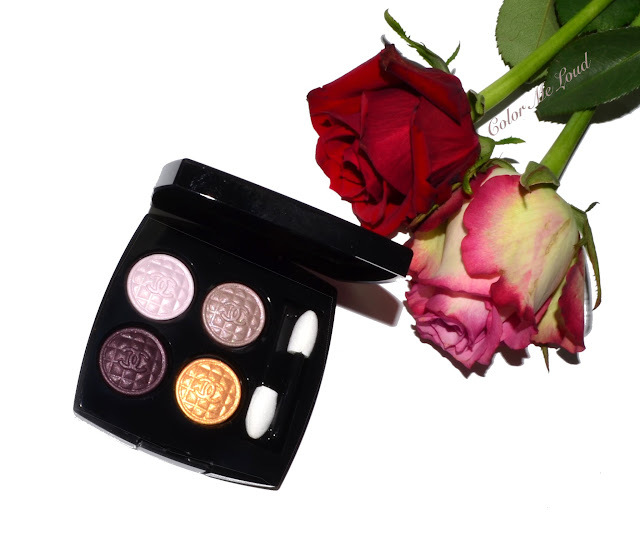 The highlighter on me shows really nice but with a delicate and soft sheen.i wanted this eyeshadow palette to be of the same quality with regard de signe but unfortunately this was not the case.i still haven't tried it with Rouge Noir IDO but I hope I will have better results ! Rouge allure Collection with Singuliere and Troublante nail polishes didn't make it to Germany? I had high hopes that it would eventually launch here in Sweden but if it doesn't launch in Germany then it's impossible to launch in Sweden since we usually have the same collection launches ! I'm so disappointed now :( I've been expecting those 2 nail polishes so much and I cannot order them from Harrods or Selfridges either :( what a pity ! I will have to contact other my SA here in Stockholm in case it comes in December! schade, dass dir das Quad nicht so gut gefällt! Ich habe eigentlich nur mit dem zweiten Ton etwas Probleme. An mir erscheint er wärmer und ist mir zu transparent. Ansonsten mag ich es sehr gern. Your swatches of the quad in comparison to the earlier quads make the differences obvious. Still you look wonderful in the Khol and le Volume. I am wearing them both today. I also got the Double Intensite in Shocking Pink, not really a Fall shade but very vibrant and beautiful. I have a lot of winey-brown lipsticks including quite a few Chanels so did not get the Rouge Noir. And the Highlighter was the same for me as you experienced-- big nothing. The blush and eye shadows of the Tom Ford summer eye and cheek palette is very wearable with the eye beauties of this collection. It's the Illusion d'Ombre in Rouge Noir that caught my attention! I'm glad it's going to be made permanent after this exciting launch. I want to get it, but I don't want to get it now. It's great to know I can buy it later :-) Thanks for the lovely swatches, and I LOVE your Vamp Attitude look. Rock on! Hi Sara, I have the same experience as you wrt the quad... :( I ended up picking up everything else in the collection because I loved the lip colors and then of course the quad just for the pretty. But after weeks of experimenting with it, I think it's going into the makeup museum! I'm glad you're finding blogging more fun now! My vacation set me back by weeks and I'm feeling stressed now! Hope your lectures are going well! I myself don't dislike harder/sheerer textured eyeshadows, but I do think the Harmonie du soir probably has the best texture and blendability. Hmmm, that Rouge Noir Illusion Ombre looks gorgeous, will need to swatch in store to see if I can resist it or not! The quad looks very pretty in the pan, but it is getting poor reviews everywhere, so you aren't alone. It's too bad I missed out on the 1st two cult palettes in this formula. I join your makeup prayers in hoping they will release a new and better kit soon. I have oily lids that eat shadow, but these shadows already sound "half-eaten". I think I would need super glue and a trowel to spackle this onto my lid to make it work. Uh, no thanks! I hauled most of this collection: blush, quad, crayon khol, both glossimers, the IdO (but there's a story behind that), the nail polishes in rose fusion and rouge noir (I didn't own it until now and I'm a sucker for special packaging! ), and the top coat. By the time I went to pick up my pieces, I didn't want the quad, because I had read such mediocre reviews, but my lovely SAs had been holding on to it so faithfully that I felt I couldn't tell them I didn't want it. There was such a feeding frenzy for this collection that they didn't even put the display out, because everything sold out so quickly. So, the IdO. I had it set aside, but when I went to pick it up, I found out it had been stolen! The SA felt terrible, so she gave me her own (unused) sample that she had set aside. I was pretty shocked that someone had stolen it. At least I got it in the end, even if it's not full size. Hi Sara-I was a bit underwhelmed with this collection-the only item is the kohl pencil-my question to you is as a kohl does this pencil hold up on the waterline or like a traditional kohl smudge everywhere ?? Hello Sarah! I want to start by saying I adore your blog...it's a go-to for me, I always stop here first when I have the time to sit and catch up on my beauty blogs! I have to say, when I first applied Coups de Minuit, I felt the same as you! I was so bummed, and I kept trying different brushes hoping for better payoff. Then one day I tried it UNDER another blush (Golden Sun is my fav pairing with CdM). It was then that I fell in love! I can't explain it, but it was gorgeous! It brought a luminosity to my face that even my husband noticed lol! Maybe give it a shot that way? I was ready to return mine until that happened! Hi, I must have been somewhere between high school and university too and I was so crazy about Umma Thurman's Pulp Fiction nails aaaah! I used to wear the shade over and over again. As you said, revolution! It has really been hard to keep up with the blog, especially last week since I got sick and had to go to work nevertheless. I was glad I am still alive haha. Anyway, things started looking better. Germany never gets the double intensity long wearing lipsticks. I suspect there is something in there which is not allowed in Europe. Greece have these too? That is very interesting. I haven't tried Double Intensity. Do you like them? I tried the palette with IdO and it didn't impress me. Could you find any tips on that? IdO has a lovely sheen and palette sort of kills it for me. Singuliere and Troublante didn't arrive here and I am still trying to get them but the ones which were sent didn't arrive. In case I end up with 2 of any shades, I will send you one of them. Too bad about exclusives. I love a few of them. Next time when I send you something, I will add some samples. We finally finished with the moving to another house in Stockholm ! The area is better and the house is bigger so there is space for more make up ! Haha! Now seriously! Have you ever been obliged to move from one house carrying all your stash ? That was a huge pain for me because I was really stressed for every little piece to be moved in the most pristine condition !